A few months ago we started our journey with the Good Night Anti-Snoring Ring. It works, and we are both very pleased with it… You can check my full review here. 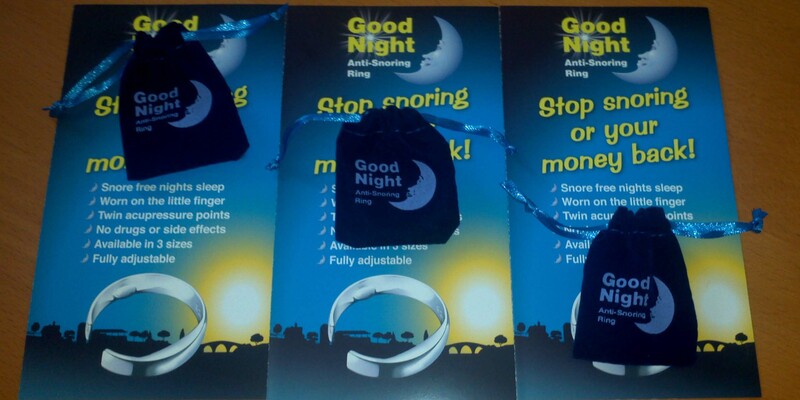 The lovely Carolyn from Good Night has provided me with a few extra rings so I can host a giveaway for my readers… so here I have 3 x The Good Night Anti-Snoring Rings to give to you! Please leave me a blog comment which is snoring related – ideally I am looking for any advice on how to deal with a snorer in the house, if you have none just tell me who this ring will be for. Ah damn am I too late to enter? I have snoring really bad, its driving my wife nuts! None of the snoring devices are helping not even http://www.snorebore.com/somnoguard-ap-review/ and it cost a fortune! I liked the good night facebook page and followed you and them on twitter. I have also tweeted you competition tweet. To tackle snoring you need to cleanse your nose of any blockage. First and foremost, understanding the root cause of snoring is an important step prior seeking a treatment. There are several effective products on the market that help to relieve snoring by masking the sounds that are made, but this not always the best solution. Excessive alcohol use, use of sedatives, dehydration, sleeping positions and being overweight are just a handful of reasons why we snore. Other factors that are out of our control such as age, gender, and genetics can also play a role. This being said, one of the most common causes of snoring is being overweight. If you are a bit on the hefty side, try shedding several pounds while taking other lifestyle choices into consideration such as smoking, alcohol use, and other factors that I mentioned. While simple snoring is annoying to those around us, it may indicate a more serious underlying issue such as Obstructive Sleep Apnea (OSA) or Central sleep Apnea (CSA). If you have any symptoms of sleep apnea such as excessive tiredness during the day despite the amount of sleep that you get or you stop breathing for several seconds while sleeping, it is best to consult with a doctor before attempting to mask the problem with an over the counter treatment. This is not to say that the anti-snoring ring, snore mouthguards, snore pillows, nose strips, and other devices do not work, its just that they have their place and one should examine the cause before trying this product or any other. I get my husband to sleep on his side or being evil hold his nose till he starts breathing through his mouth instead, thank goodness he’s constant nightshift though or else i think we would have divorced by now. I have tried just about everything to get a good nights sleep, my husband’s snoring is horrific – I’m hoping I can rely on an Anti Snoring Ring to sort it out. My Husbnd needs this bigstyle!! sometimes i can hear is snoring when i am in the shower upstairs and he has fallen asleep on the settee downstairs!! Sorry, as for advice. Go see a doctor.The tests are painless. Just a monitor strapped to your wrist and a thing clipped on your finger and go to sleep at home as usual. second one I need is a monitor on my chest as the first was inconclusive but is still a go home and sleep with it thing. If you are overweight (I am) that may well be the cause. extra fat around the throat area can cause snoring too. Either way, going to your GP isn’t a bad start just in case. Win lose or draw with the competition I hope my experience has been of some help and you have my email on the entry form if you need any more help from my own experiences. (gazbennett101@gmail.com) Just drop me an email and I’ll add anything I know as and when I see the doctors ect. Entering for me (well for my mrs) I am the snorer in our house. it is really bad and I am currently being tested for sleep appnia? as I have a few other symptoms too. anything that can give my partner a better nights sleep cant be bad. tonight”works most times.although.he is always tired the next day for some reason?? He might want to see a doctor. I am currently being tested for sleep apnia? as I snore constantly and am always tired. it isn’t anything fatal but it basically interupts your sleep without waking you so you never feel like a full nights sleep when you have. Following on Twitter, @SylviaP70. Liking on facebook. My husband snores heavily when he gains weight, so my advice would be to keep your weight under control.